We all have stories to tell! Sometimes, we have fun adventures that take place in our daily lives. Other times, we have tough stories that unfold over the course of our work and school days—even over our years. Some stories are easier to tell than others. Some people tell their stories naturally, and others need to be encouraged to share. Some need to be invited to share. Some of our favorite family dinner questions lead to great table conversations. We begin with two simple questions, “What was the best part of your day? What was the hardest part of your day?” Then, we move around the table, each telling the tales of our day. As a result of these two simple questions, we have heard some really funny stories . . . and some really gut-wrenching ones. 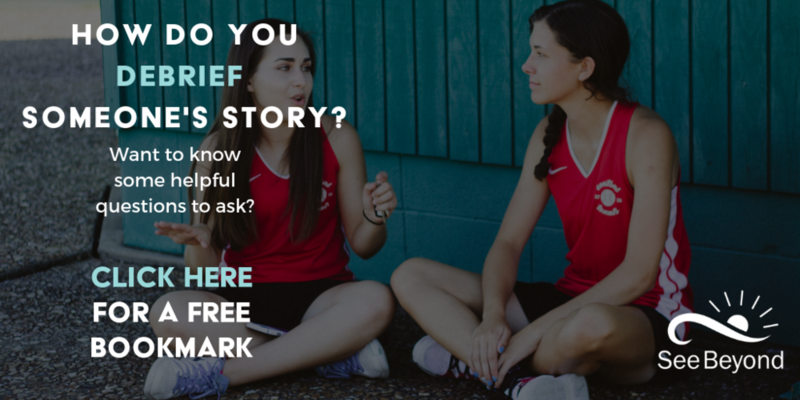 What can we do to invite someone to share their story? 1. Show an attitude of genuine interest in the person and his story. Have you ever been out having coffee with a friend—you got so wrapped up in talking about your own life and your own story that you completely forgot to ask him about his? I wonder how that friend felt after your coffee date. On the flip side, have you ever been talking to someone who appears completely uninterested in you and what you are saying? This experience can leave us feeling unimportant, unloved, insignificant, disrespected, misunderstood, “unheard.” Can you picture it? Can you feel it? We live in a “me-centered” world. When meeting with friends, may we remember to show an “other-centered” attitude. It can be as simple as saying, “I would love to hear how things are going with you too, a bit about your day or about your life journey.” Words that show and express a sincere interest in the person will encourage him to open up and to share his story with you. 2. Create a secure environment for the person to tell his story and become a “safe” person—don’t gossip, etc. Hearing someone’s story—a part of his life, a part of his heart—is sacred. Letting a person know that you can be trusted to “carry” his story is an important first step to encourage him to open up. It can be helpful to state, at the beginning of the conversation, that you will keep everything confidential—their story and all that they share with you. This creates a safe and comfortable atmosphere that is conducive to sharing one’s journey. 3. Ask good, “open” questions. This may seem obvious, but sometimes, we don’t really know where to begin. Asking “open” questions invites people to share. In our family’s dinner conversation, asking, “What was the best part of your day?” invites everyone to talk about what happened in their lives. This “open” question unlocks the door of their hearts, leading to deep and meaningful conversations. that open the door to conversation? Click here for a free bookmark. The possibilities of “open” questions are endless! On the other hand, asking “closed” questions results in a simple “yes” or “no” response and can quickly close the door to conversation. For example, we could ask a friend, a spouse, or a child, “Did you have a good day today?” However, their short responses of “yes” or “no” won’t necessarily lead to deeper connections and conversations. This “closed” question doesn’t invite them to naturally tell the stories of their day. Different personalities may need more or less prodding and encouragement to open up and share their story. When talking to internal processors, it may be helpful to ask them questions as they walk through their story. For example, “What happened then?” or “What happened next?” This will invite them to continue telling their narratives at places where they may get “stuck” and don’t know where to go. On the other hand, verbal processors may share their stories more easily—sometimes barely coming up for breath. Read the person and ask questions appropriately and as needed. Listening is a “gift” that we can give, especially when it’s “other-centered” listening. Something powerful and freeing happens when our story is finally “heard” by a caring and empathetic listener—someone who truly cares about you and what your story means to you—rather that just someone who listens to feed his own curiosity. It’s also important to practice the skill of not interrupting. This is a skill and behavior that we teach our young children. However, sometimes, as adults, we forget how to do this. Listen with our body language and facial expressions. We have all experienced moments when we talk to a person who is obviously not listening to what we are saying. They don’t look at us, or if they do, they have that “glazed look” in their eyes. Sometimes, they seem very distracted—looking at what’s going on around them, or even worse, looking at their phone. Maintaining eye contact with the person and displaying appropriate facial expressions and body language shows our engagement and interest in him and his story. 5. Reflect or “mirror back” what we hear the person saying. This is called “reflective listening.” As the listener, we can use our own words to tell the person what we are hearing him say. This reassures him that we are listening well and that his story is being “heard.” This will invite him to share more and will open the door to further and deeper conversation. 6. Set aside uninterrupted time. Letting a person know that we have time to spend with him—that we aren’t in a hurry—will invite him to share his journey. There is nothing worse than being interrupted and stopped just as we are beginning to open our heart and share our story with someone—just because he has another appointment or somewhere else to go. Be intentional to set aside sufficient time to meet with a person. This will free him up to tell his entire story, and neither of you will feel the pressure to rush things. This will create a more relaxed setting that will be conducive to sharing and to listening well. Is there someone in your life who could benefit from being “heard” today? Is there someone who has a story “bottled up” inside of them that needs to be “told” and “released?” Could you invite that person—that friend—to have a cup of coffee or tea and then invite him to share his story? Use your genuine attitude, your “safe” confidentiality, your curious questions, your listening body, your insightful reflections, and your precious time to draw the story out. Invite a friend to tell his story today. You never know, perhaps he will turn around and invite you to share yours! What in the World is 'Debriefing'?